Starting at $29 per month. Knowing what makes your phone ring shouldn't be complicated. 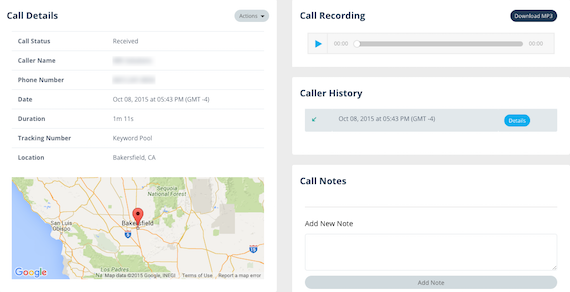 At a glance, the reporting dashboard tells you how many calls you’ve received as well as some basic information about those calls. Here you can find details about the call including the caller’s location, what pages they visited on your site and a recording of the call. As soon as a call has been completed, you’ll receive an email notification giving you basic information about the call and link to the Call Details page. We can create toll-free tracking numbers for you. They cost $5 per number per month on top of the $30 monthly base fee.